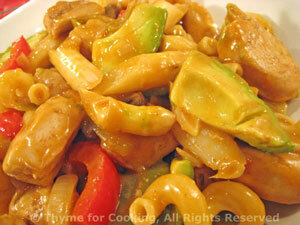 Pasta, Chicken, Avocado, Peanut Sauce, Thyme for Cooking spring dinner. When done, drain and put into large bowl. Cut chicken breasts into large, bite-size pieces. Cut pepper into long strips. Heat oils in a large skillet over medium heat. Add paprika, cumin, and sauté briefly. Add chicken and brown well, about 5 minutes. Add mushrooms, onions and garlic, stir-fry 2 minutes. Add chicken stock, sherry, reduce heat, cover and let cook for 5 minutes, until chicken is cooked through and vegetables are just starting to get tender. Add pepper, soy sauce, peanut butter and stir well. Add to pasta, stir to combine. Add avocado to pasta, stir gently to combine and serve.